Were Aliens Depicted in Nazca Lines, Peru? How to do an Alleppey Houseboat Trip? 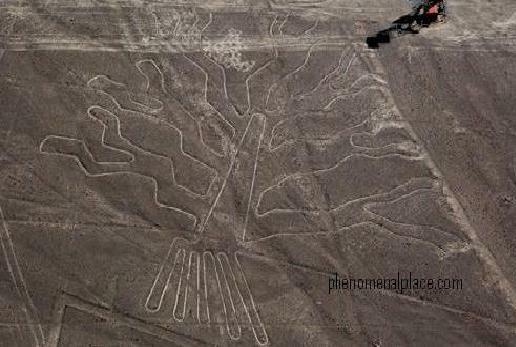 Nazca Lines of Peru - A sign of Alien Occupation? No matter how many places you go, Nazca lines (or Nasca) the weirdest and the most perplexing sight in the world. These figures were drawn by Nazca tribes around the time of the birth of Jesus Christ, and sometimes ranging over six hundred feet wide. 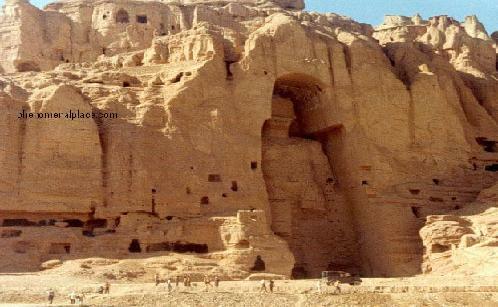 When the Buddhas of Bamiyan were destroyed, the Taliban Muslims were shocked to find what was beneath the statues. 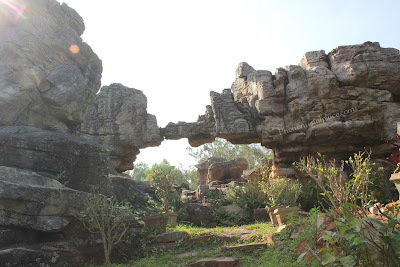 Behind the statues were around 50 caves which was used (once upon a time) as a dwelling place for buddhist pilgrims. with more than 200 acres in land, the temple is carefully safeguarded by a moat. The sheer size of Angkor Wat will make you speechless. It was built in the honor of Vishnu, a hindu god. The design is based on Mount Meru, which is the mythical abode of Devas (Hindu Deities). Don't want to go to Europe to see french culture? 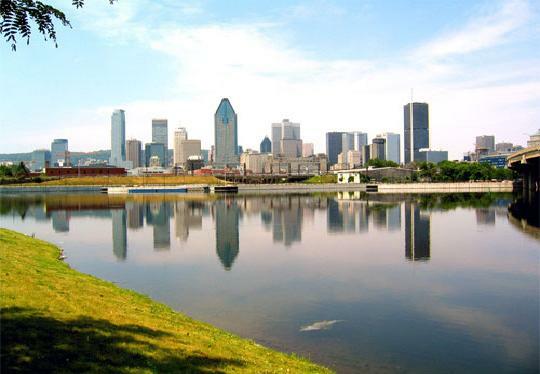 Just go to Montreal! Amazing places, french culture, basilicas, museums and much more!! A torture chamber intact with 8 century old torture devices, A ghost sobbing behind the wall and much more..
A Pyramid made of more than 2 million stones each weighing a ton, 4600 years ago. Unsolved mysteries of the Giza Pyramid, the interior virtual tour and fun facts! Click Now! A country of over 330 islands, over two thirds of them are uninhabited. 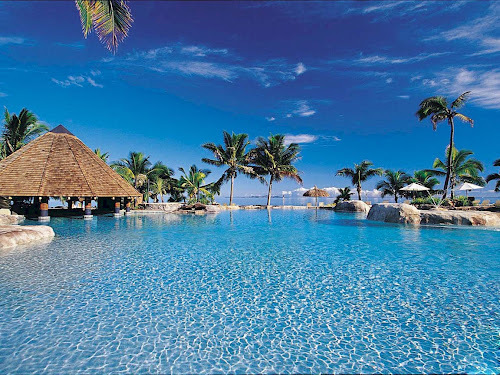 The scenic beauty is unparalleled, and it is the best place to go whether you want to relax, or have fun round the clock! At the Taj Mahal, we can see a mysterious passage on the floor that goes directly underground. Watch the video below or read on. Now, if we take a closer look, it is not only locked with meshed metal doors, but if you look inside the doors, it has been covered with wooden boards. This not only means that you are not allowed to enter this passage, but you are also not even allowed to see what's inside. Where is this underground passage going? This is located just outside the main structure of Taj Mahal, but if we walk inside the Taj Mahal, you can see yet another massive passage that goes underground. This is also locked, but there is a sign that says don't stop here or take pictures of this closed passage. Why should a sealed passage, not be photographed? Does Taj Mahal really have a secret basement underneath? Authorities reluctantly accept that Taj Mahal does have an underground area and they say that there is a chamber which contains the tombs of King Shah Jahan and his wife Mumtaz. But at ground level, we can also see two more tombs which are also the tombs of the same King and Queen. Why would any dead person need two tombs, one at ground level and other in the underground? They say that the underground chamber and tombs are also made of white marble, just like the rest of the Taj Mahal, which is entirely made of white marble. But is the Taj Mahal, made completely out of white marble? To understand the truth, let's go to a side where visitors never go. We have to go into the nearby river, and then observe what's going on. You can see that it has a huge base which is not made of white marble, but is made of red sandstone. In fact all the structures surrounding the Taj Mahal are made of red sandstone. This is best visible from the river side. Remember the underground passage which was sealed off in plain sight? This is also located on the river side - The passage is clearly made of red sandstone, but look at the material on the floor, this is also red sandstone. On the river side, there is something very interesting hiding in plain sight - Did you notice this strange rectangle on the basement? This is one of the entrances that directly leads into the underground zone of Taj Mahal. 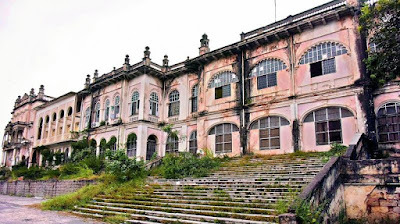 Because an American Architect by the name of Marvin Mills took clear pictures of this in 1974, and it had wooden doors, but was locked, so he couldn't see what was inside. 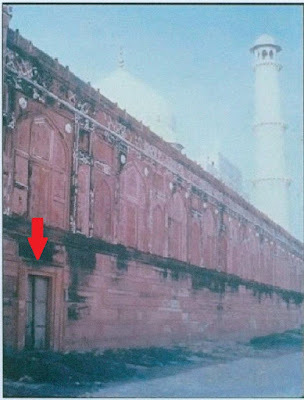 He took a small piece of wood from the door and sent it for radio carbon dating and the result showed that the wood pre-dates Taj Mahal by at least 250 years. 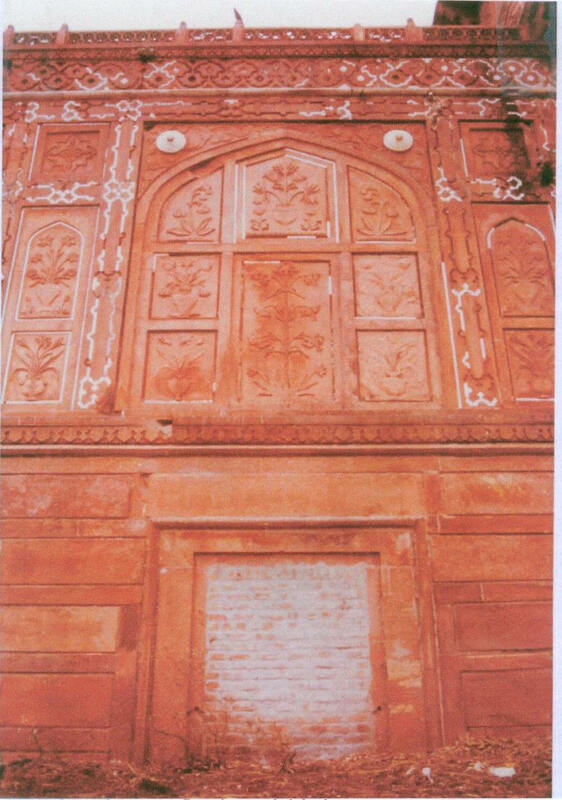 Immediately after this information hit the newspapers, authorities removed the wooden door and sealed it off with bricks and plaster, which is why it appears in a different color now. Why is the government repeatedly sealing off all the entrances leading to the underground zone of Taj Mahal? Authorities have come up with a rather strange explanation. 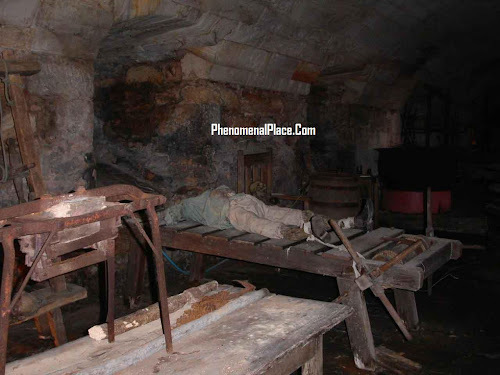 According to them, the basement contains mummified bodies of the King and Queen. If these bodies are exposed to the atmosphere, they will get contaminated. They say this is why all the entrances to the basement have been completely sealed off, to keep the basement airtight. 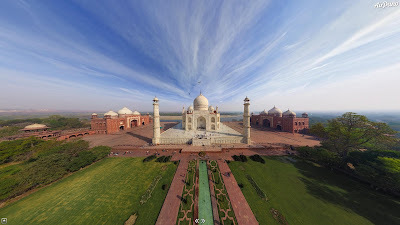 This is really strange because the floor of the Taj Mahal is full of ventilation shafts which directly go underground. If you look through, they are so deep, that it just becomes dark. If authorities are really preventing the exposure of the mummies, which are already sealed inside marble tombs, why did they leave these vents open? Why do they have to close only the bigger holes, through which human beings can enter? It's easy to understand that authorities don't care about the air going in, but just don't want human beings to enter the underground zone. If the basement of Taj Mahal merely contains the tombs of the King and Queen, why do we see multiple passages to access the same chamber? And why does the carbon dating evidence on the wooden door show that it was created centuries before the Taj Mahal? 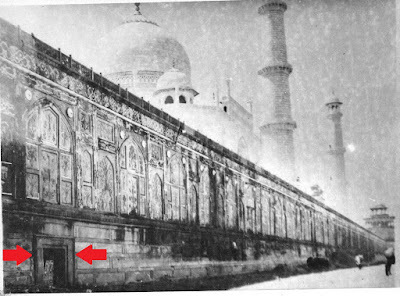 Is it possible that the basement and the rest of the structures around the Taj Mahal were built centuries before King Shah Jahan? 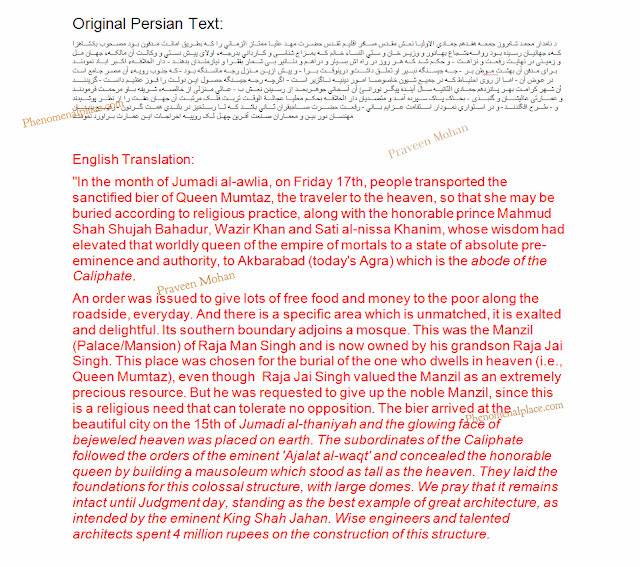 To understand this, we have to read the book called Padshahnama written by the court historians of King Shah Jahan. This book explains the King's decision to build Taj Mahal in memory of the Queen, but the same book actually proves that the rest of the structures around it were already in place. It explicitly mentions that King Shah Jahan did not construct the Taj Mahal on a vacant land, but instead bought the ancestral palace or mansion from another King called Jai Singh, and then constructed the white marble structure in that place. Some historians have tried to cover this fact by arguing that the word 'Manzil' means a tiny resting place, and not a mansion or palace. 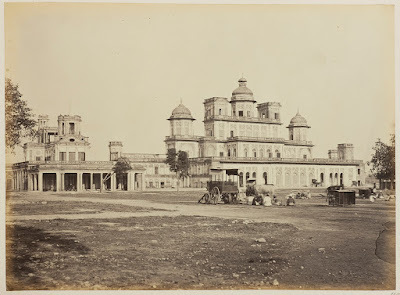 I have attached two pictures below which are Chattar Manzil in Lucknow and Errum Manzil in Telengana. 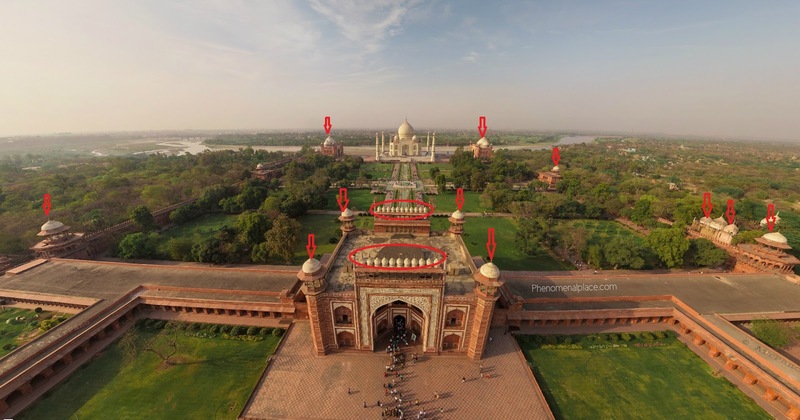 This clearly validates that there was a palace at the site of Taj Mahal. Okay, back to Taj Mahal. If King Shah Jahan wanted to build the Taj Mahal, he could have built it anywhere in the same area, the entire area is still vacant. But instead, he chose to buy an existing structure and built the Taj Mahal on it. Why did he do this? Because constructing the Taj Mahal, the white marble structure itself is a monumental project. In fact, King Shah Jahan almost became bankrupt because of it. If he chose to build the Taj Mahal on a vacant land, especially near the river, the expenses and efforts would double because he would have to create a massive foundation. The aerial view, actually confirms that the basement and the rest of the structures were built a long time before the Taj Mahal. All the ancient structures were built completely out of Red Sandstone and bricks and resemble a fort. 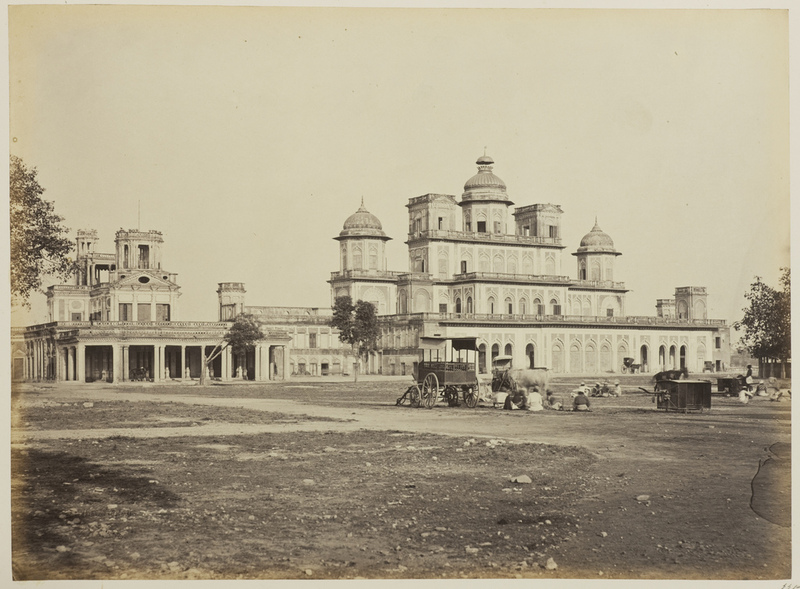 These were merely modified by King Shah Jahan by adding white marble domes on top. This is a very clever architectural modification, because we cannot understand this from the ground view at all. Now, let's go back to the underground zone of Taj Mahal. 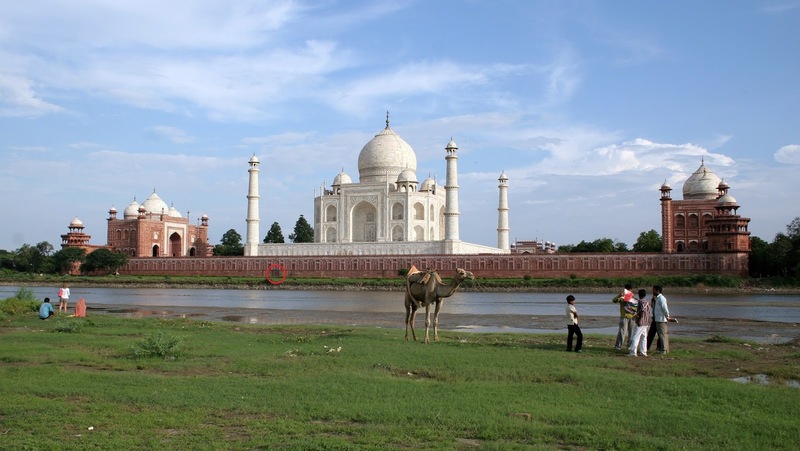 It is clear that this zone predates Taj Mahal, but what's inside? Is it possible that the basement actually holds an ancient secret, which the authorities do not want us to find out? Did you notice the coins strewn on top of the sealed passage? These are religious offerings by locals, who believe that the underground structure is a temple of ancient Gods. Locals refer to this temple as the Badalgarh temple, and claim that it stretches underground for many, many miles. 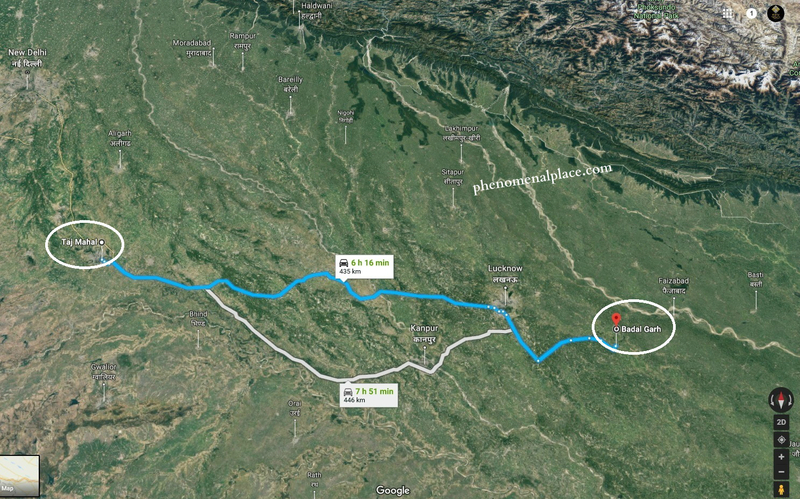 So, I searched Google maps for Badalgarh, and the closest Badalgarh is about 270 miles away. 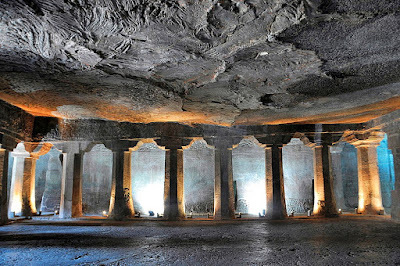 Can an ancient temple stretch underground for 270 miles? 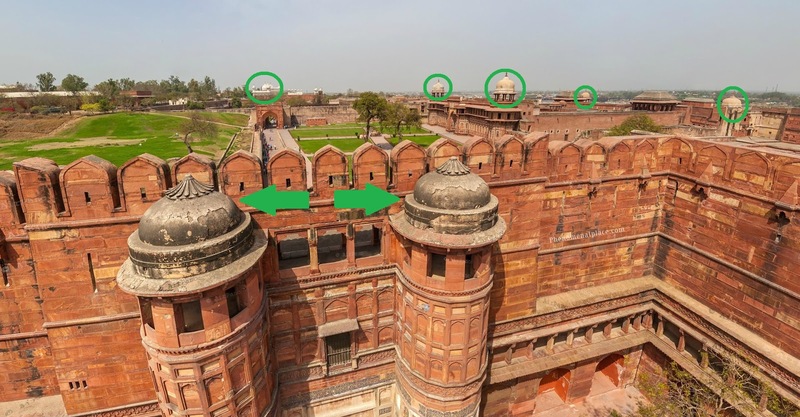 This seems kind of impossible, so I began hunting the nearby areas, and then I find something very interesting at this magnificent fort called the Agra fort. This is just 2 miles away from Taj Mahal. The original name of Agra fort was Badalgarh, this is confirmed by historians and archeologists. But again, we can see the same pattern - historians clearly state this structure was merely modified by King Akbar, who is the grandfather of King Shah Jahan. You can see that while the main structures are made of red sandstone, the domes are all made of different material. This is a breathtaking fort, but there is only one thing I am looking for: An underground passage or at least a small tunnel. And, not surprisingly: There is a huge rectangular passage that goes straight underground, and has meshed doors, but again you can see that it's locked. I am told by the tour guide that this is in fact an old passage that goes underground, and is not used any more but has been locked by authorities to prevent anyone from falling in and having accidents. Now, the problem is, it is locked from the inside of the passage, this is why you don't see a key hole on this side of the lock. This means that at least one person is inside this passage, as we speak, there should be no doubt about this. Who is using these underground facilities and why? And again, why do we see similar ventilation shafts going vertically down all over the Agra fort as well? And here, in plain sight, we can see stairs that go down. As usual, this is also locked, but at least we can see what's inside. This is not just a small tunnel, but you can see a huge volume, they have and there is something very interesting here: A dome shaped arch, very typical of Mughal architecture. 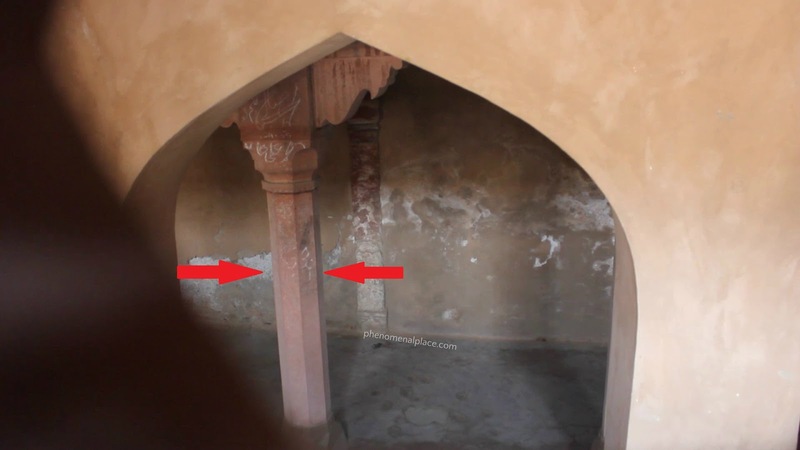 The first look into this forbidden zone shows that these constructions may not be ancient, they were in fact built by King Akbar or by his descendants. And then, I manage to peep through a hole. Here we can see some solid evidence that the underground structures belong to ancient times, the 8 faceted pillar, with a square base which is found in almost all ancient Indian temples. In fact, there is a name for this in ancient Indian texts, it is called astakona skambha. You can see these multi-faceted pillars in almost any ancient temple in India, even the musical pillars of Hampi, are multifaceted. 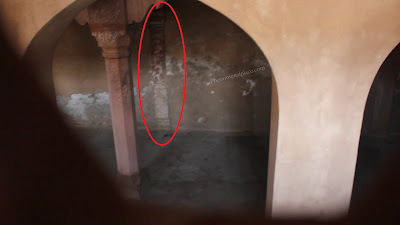 Note that the pillar is also made of red sandstone - the same material which makes up Taj Mahal's basement. And these are newer brick walls built centuries later, modifying the ancient underground structure. And look at this area, a similar octagonal pillar has been removed because it was interfering with the newer brick construction. It is evident that king Akbar or Shah Jahan constructed these newer walls , which is why they look fresh, but the pillar looks much older. 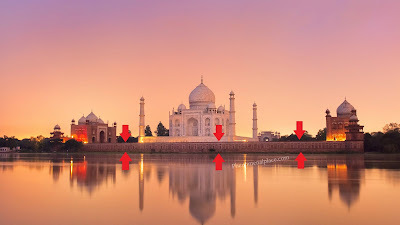 This proves that there is an ancient underground structure that is being hidden from us, on top of which both this fort and the Taj Mahal are built. Remember I said, the distance between the Taj Mahal and Agra fort is about 2 miles. This is how the Taj Mahal looks from the Agra fort. 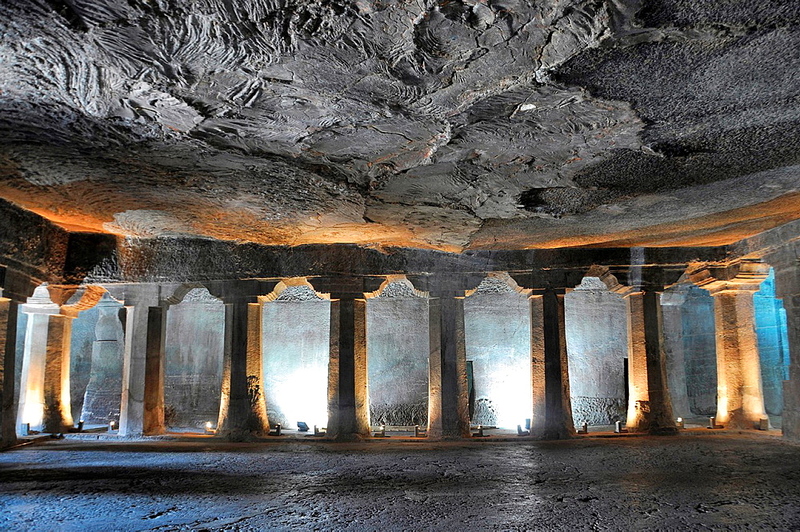 This means a vast underground city stretches between them, much like the underground city of Ellora caves. So, what do you think? 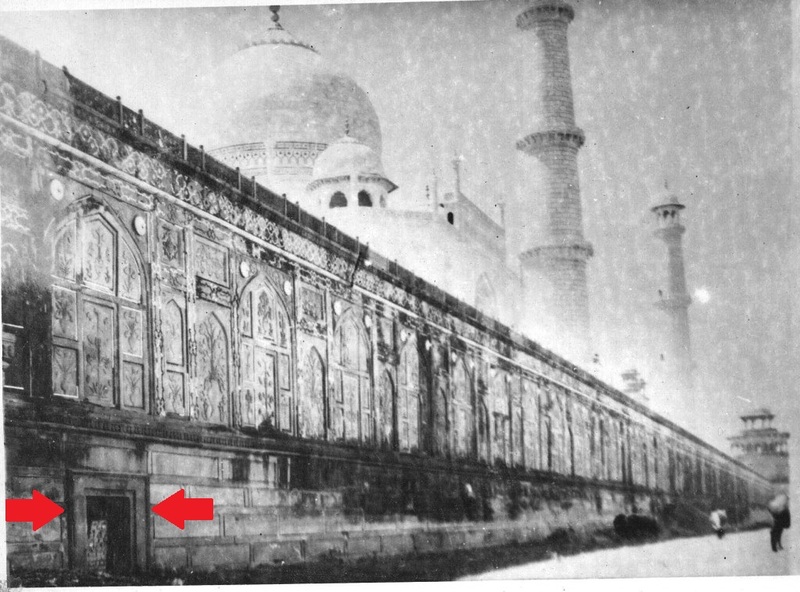 Why do we have a sealed basement inside the Taj Mahal? What is behind this entry way that goes underground? Why are the locals worshipping this passage? What about the radio carbon dating of the wooden door? Why did authorities immediately cover it with bricks? How do we explain these ventilation shafts? Why is this door locked on the inside at the Agra Fort, which is miles away from Taj Mahal? What about the ancient pillar found inside? More importantly, why are all these places locked? In my mind, there is no doubt, that there is a secret underground facility of some sort, an ancient mystery kept hidden from us. What about you? Please let me know your thoughts in the comments section. 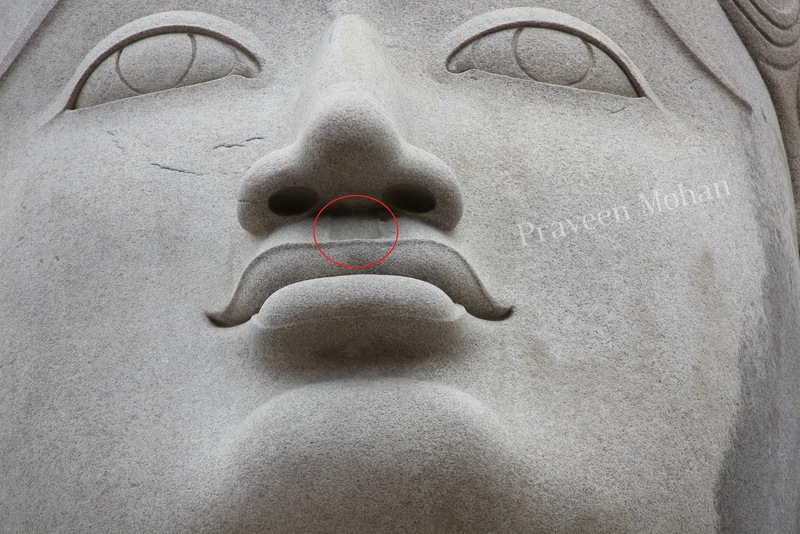 Hey guys, today we are gonna explore the mystery of the largest monolithic statue in the world. 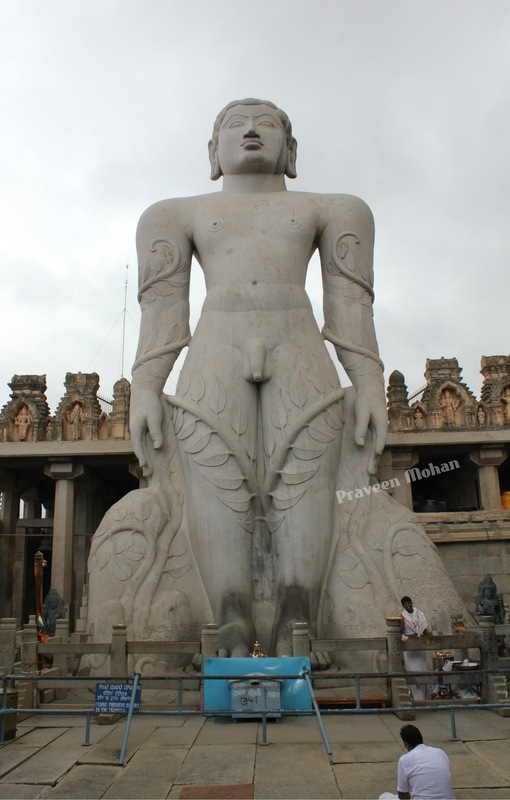 This ancient structure, called Gommateshwara was built more than a thousand years ago and is made of one solid rock. Watch the video below or read on. 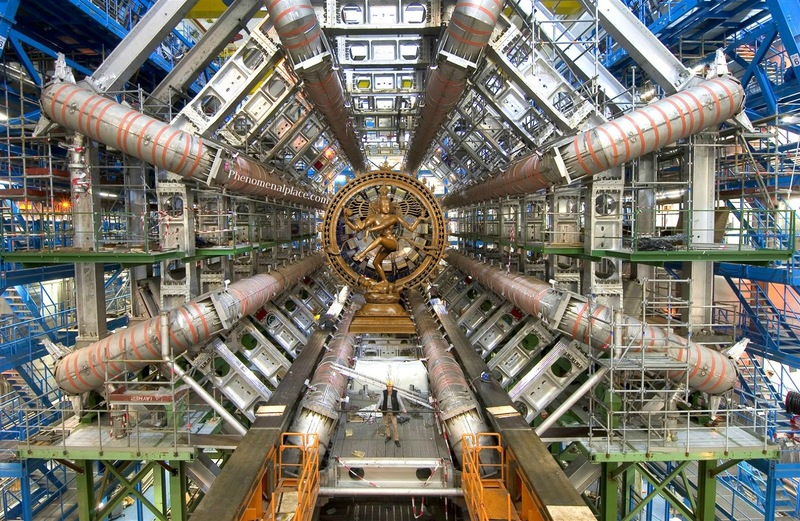 How was it created at a time when historians claim there was no advanced technology? Is it possible to move such a huge structure to the top of a hill, with just primitive tools and techniques? This statue stands about 57 feet tall, nearly 40 feet wide at the base and weighs more than one thousand tons. This is a whopping 2 million pounds of solid rock. So, the question is: How was it transported to the top of this hill which is more than 400 feet from the ground? Experts are not able to answer this question, but some have speculated that the stone was available on the hill itself. Even better, if this rock was already in place, then sculptors would have to simply carve the statue, since there is no transportation involved. Is it possible that this rock was naturally in place, before this statue was carved? No, experts confirm that this statue is made of white granite, a material that is completely different from the rest of the rocks on the hill. 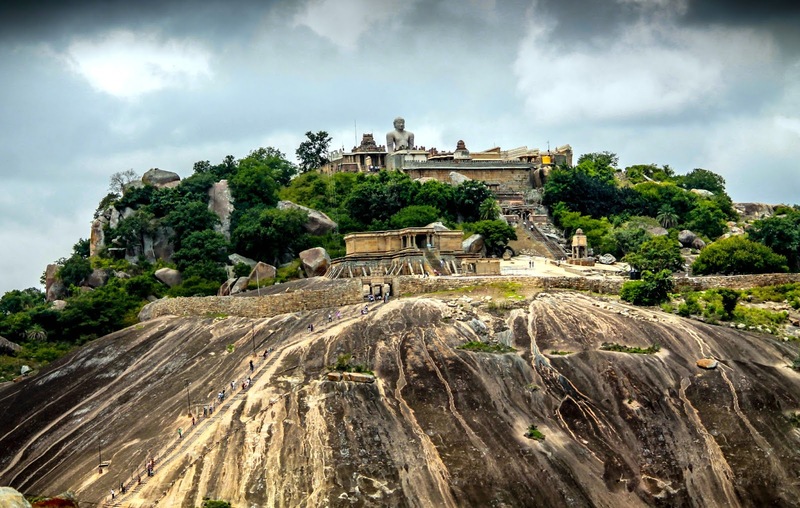 In fact, there is no white granite anywhere on the hill or even in the surrounding area. 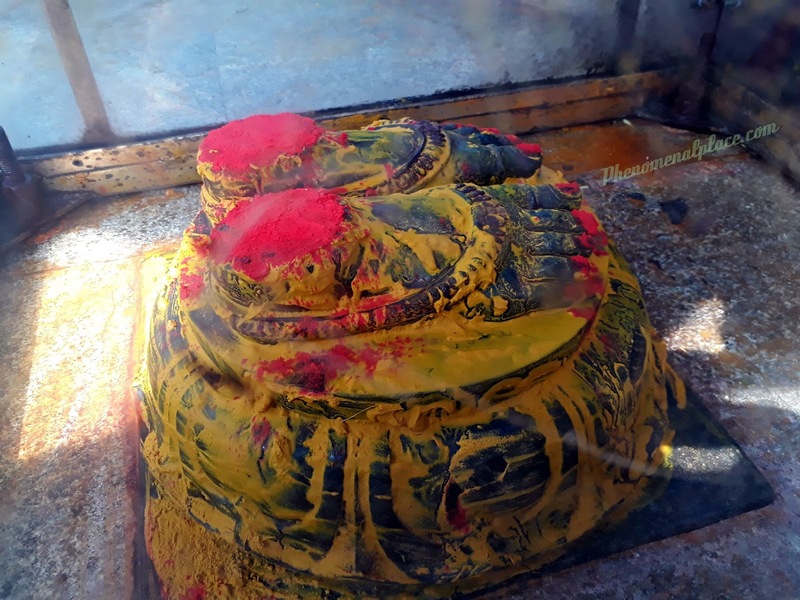 You can see the sharp contrast in color between the statue and the rest of the rocks which make up the temple. So, the only possibility is that this statue or an entire slab was transported from ground level to the top of the hill. Let us assume that they moved the statue, and not an unfinished slab, because the unfinished rock would weigh nearly twice as much as the carved statue. Some historians have argued that elephants were used to move this statue to the top. Now, an elephant can lift a maximum weight of 660 pounds. This would require a total of 3000 elephants to move the statue, but how do you even put 3000 elephants in a row, and tether them to a 57 feet long object? Since this is not possible, how else was the statue moved to the top? Perhaps we can find some clue by examining the statue closer. 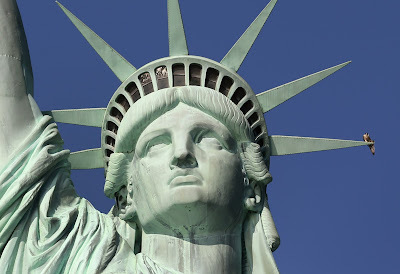 The statue is famous for something very interesting, it has no human errors at all. If you draw a line in the middle, it is perfectly symmetric, throughout the entire height of 57 feet. Is such a symmetry possible without the help of machines? Granted, India is the land of sculptures, and we can find millions of amazing carvings, more than any other country in the world. But this statue is quite different. Because of its enormous size, it has to show even the minute details. For example, you can see this groove between his nose and lips. All human beings have this groove, however most sculptures do not show this feature. Even the statue of liberty does not have this feature. But it is carved on this 1000 year old statue. These features are not visible to the naked eye, they are only visible if you zoom in with your camera. And it shows something truly extraordinary - several, intentional cuts and scratches carved on his face. This is not a result of corrosion, I will show you corrosion in a minute. Why were these scratches made? Because this statue represents Bahubali, a prince who fought his own brother. Ancient texts mention that both brothers were badly bruised in a fight, just before Bahubali started his meditation in this standing posture. Why did ancient builders create even the smallest details, even though historians claim ancient people could not see these bruises with their naked eyes? Look at the little patches of flesh on the corners of the eyes, you will never see these anywhere, these are extremely minute details which have been carved to perfection. & If you visit this site, zoom in on these leaves, the veins on these leaves are unbelievable, just like real leaves. Can details like these be carved in perfect symmetry with human hands, or were ancient builders using machines for carving, just like modern human beings? 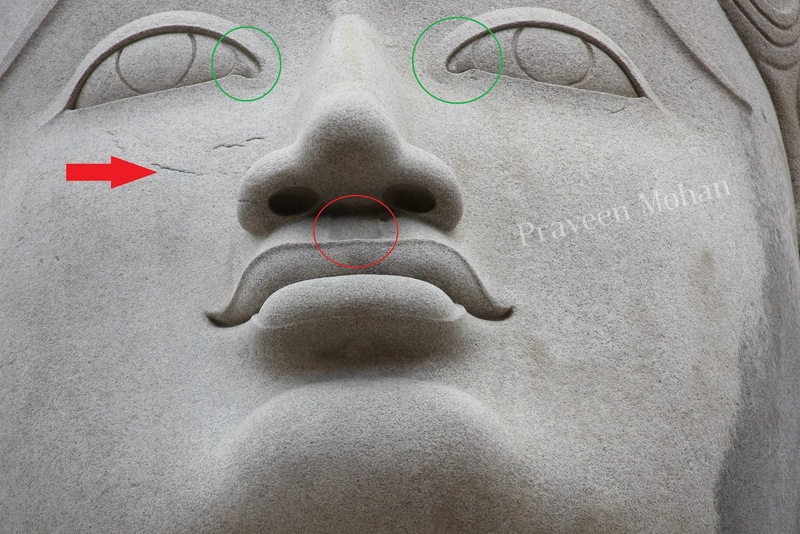 But the most interesting clue is not on this huge statue, but is found on 2 small statues placed near his feet. Both these statues hold something very strange in their hands. They look like modern day drilling and polishing tools. 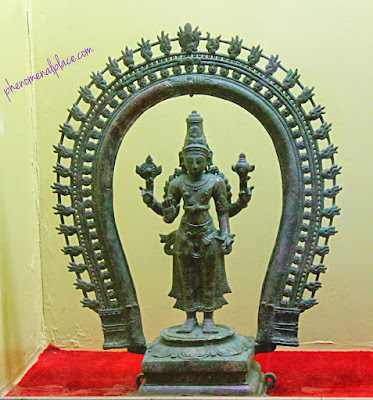 Remember, we have seen these same tools at Hoysaleswara temple, which shows solid evidence of machining technology. Why do we always find these carvings next to mysterious structures which cannot be explained by archeologists? Were these clues left by ancient builders, for us to understand the truth? Here is yet another carving seated directly opposite to the big statue. We see him holding not one tool, but two. The device on his right hand, not only shows the tool's head, but even shows the long base, just like modern day machines. Look at today's stone carving tools, all modern sculptors use an elongated handle with a tool bit at the top. This is identical to what we see in this thousand year old carving. 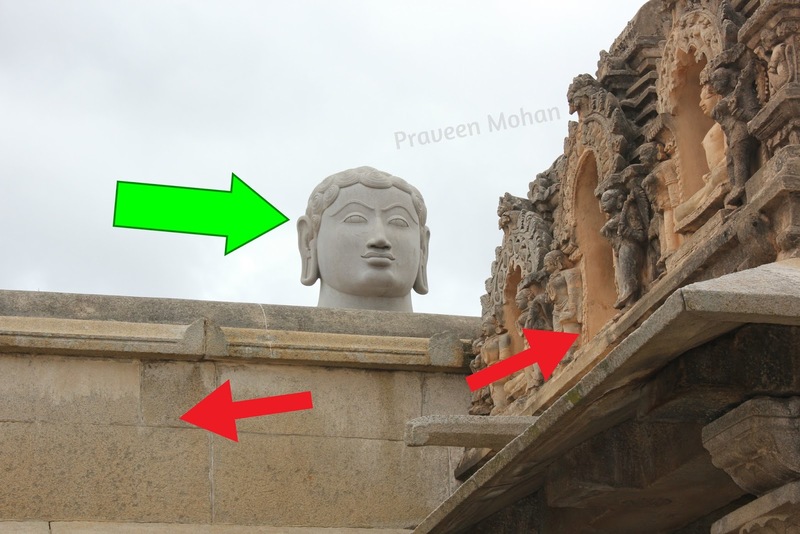 Is this a coincidence, or were ancient builders also using machines for carving this humongous statue ? Is this why it is perfectly symmetric with uncanny details? But there is something much more mysterious about this statue. Any rock must undergo corrosion, this cannot be avoided, but you can see that there is no trace of corrosion on this statue. It looks like it was built yesterday. This is really confusing because the face of this statue is completely open to the wind that has blowing for the last 1000 years. 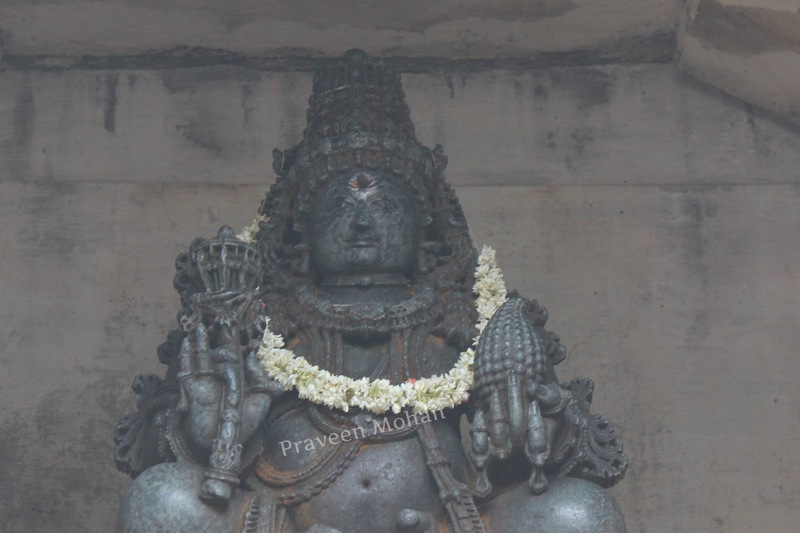 You can see his face from many miles away, which sticks out beyond the height of the temple. But the statue has remained remarkably fresh, and you can see the rest of the temple has corroded. How is this possible? Indians are very superstitious people and once in 12 years they gather and pour a variety of items including sugarcane juice, saffron paste, milk, sandalwood powder and other strange items. A few years ago, scientists tested this concoction and realized that this actually strengthens the rock, and prevents it from corrosion. Now, the question is, how did people come up with this anti-corrosive technique, a thousand years ago? How did this advanced knowledge of stone treatment become a mere religious ritual today? What's really fascinating is that the devotees usually pour all the quote on quote offerings on top of this statue's head. 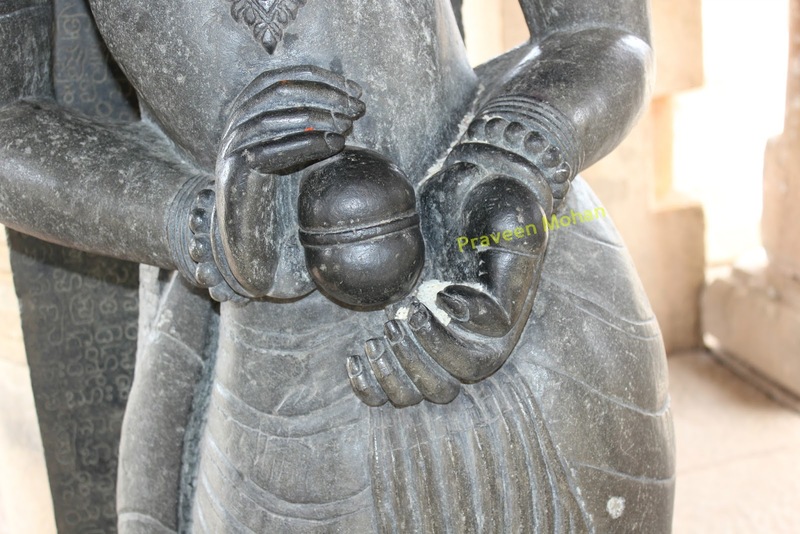 This is why the top of the statue shows no corrosion, but the bottom of the statue, shows traces of corrosion, because the anti-corrosive compound does not fully touch his feet. If the archeology department recreates the compound made by superstitious devotees, and applies it on ancient temples, they can preserve all these corroding structures. 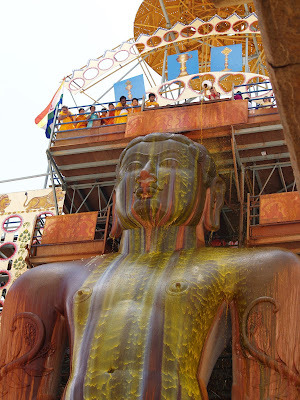 Now, let's go back to the mystery of moving this one thousand ton statue to the top of the hill. There are no ramps on the hill and these stone steps is the only way to climb. The hill is very steep, some people even faint, while climbing these steps. Today, there are services to carry people, because it is too difficult for them to walk up and down. If it is too difficult to pull yourself up, how do you pull a one thousand ton rock to the top of the hill, more than 400 feet above the ground? The only way to move such a big statue is through advanced technology. 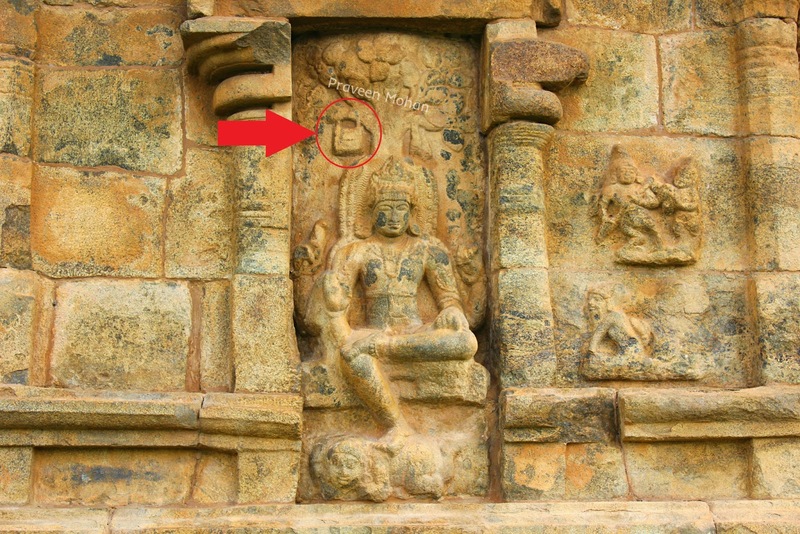 Perhaps the secret of this technology lies in studying this mysterious carving, found in the same temple. This figure is shown holding a ball like device, which has a band in the center. But if you look closely, the ball is not touching the upper hand or the lower hand but is floating in mid-air. 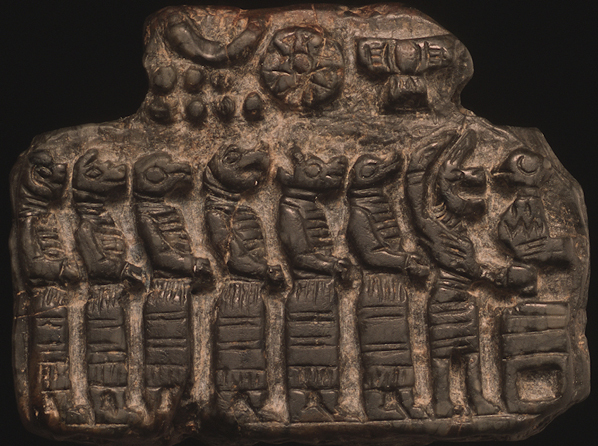 Today, we have just begun to understand the technology of magnetic levitation, but how was such a carving made, a thousand years ago? More importantly, was some advanced technology like magnetic levitation used to lift this statue to the top of the hill? So, what do you think? Were machines used for carving this statue? How else was it carved to perfection? 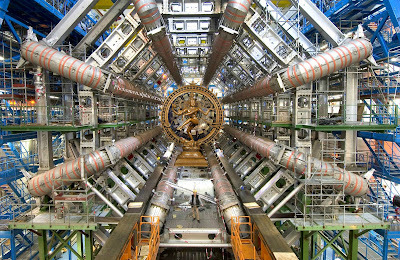 Was some kind of advanced technology like magnetic levitation involved in moving it? How else could such a statue be lifted to the top of the hill? Please let me know your thoughts in the comments section. 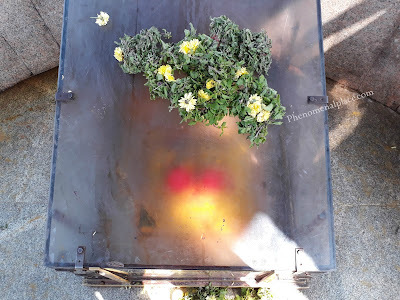 I found a thousand year old carving in the ancient temple of Gangaikonda Cholapuram which shows something very strange - A handbag hanging on a tree. Watch the video below or read on. Carvings of handbags are found in many ancient sites around the world, but this is the first time it has ever been spotted in India. 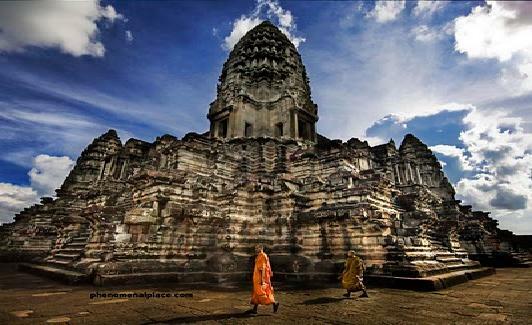 This temple is estimated to be built around 1025 A.D which is a thousand years ago. In this video, let us examine who this person is, why is the bag hanging from a tree branch and most importantly, what's inside this mysterious bag. But, this is the first question we must ask ourselves: Is it possible that this is just a simple handbag which was used to hold ordinary objects? 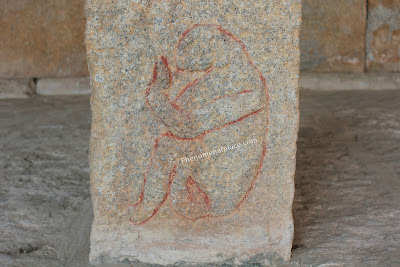 Does the carving below, show an ancient man, using a handbag just like what we do today? The answer is no. Because the carving does not show a human being, but Lord Shiva who is considered the supreme God in Hinduism. This is clear when you see the characteristic features like the little demon below his feet and a snake in his arm. Many depictions of Shiva show the exact same features - the little demon and the snake, confirming that this is in fact, Lord Shiva. According to many religious experts, Shiva is the first God and all other gods arrived on earth, after him. 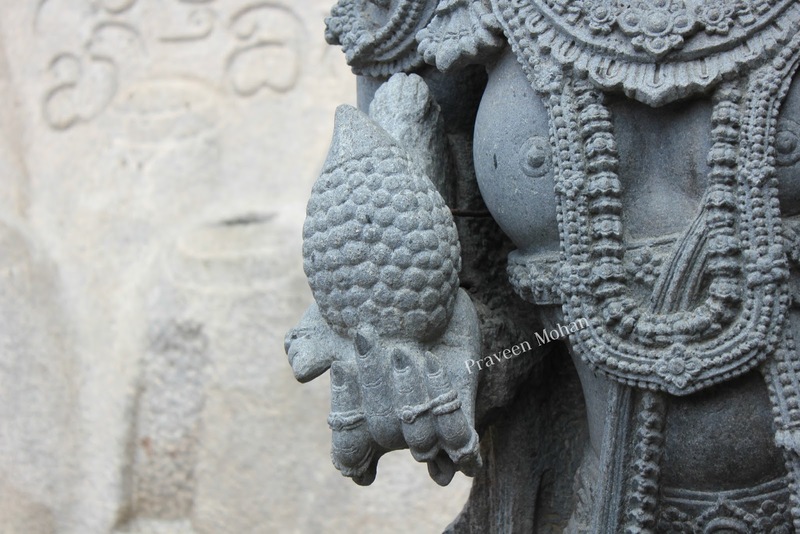 Around the world, there are many deities carved with the same handbag. The Sumerian Gods have it, the site of Gobekli tepe has the same carving, and they have also been found in New Zealand and Central America. Experts don't know what was inside these handbags and they do not want to agree that handbags existed many thousand years ago. Why is this? Because historians and archeologists claim that all these Gods are fictional characters who did not use physical items like handbags. So, they come up with some abstract, philosophical explanation. They explain that the strap of the bag, which looks like a semi-circle, represents the hemisphere of the sky and the solid, flat base represents the earth. Therefore, they say that the Gods are shown holding the symbol of heavenly and earthly powers. 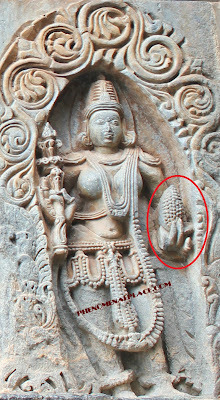 But these "experts" would not have expected us to find a carving like this in India. 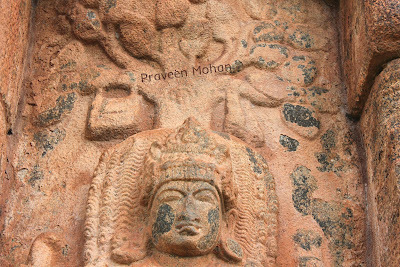 It is not shown in the hands of Shiva, but hanging from a tree branch. This clearly proves that this was not a mere symbol, but an actual handbag which contained something very important. But there is another surprising clue in the same carving. You can pause the video if you want and try to find out what it is. The carving shows not one handbag, but two. On the other side of the tree, another handbag is shown hanging, but you can only see the strap. The rest of the bag is not seen because it is behind Lord Shiva's dreadlocks. This clearly proves that these bags were not just symbols, because symbols are always shown in full, in order to be understood. This was an actual handbag, a physical object, which is why it is shown partially. So, what would Lord Shiva, the God of unlimited power, carry with him at all times? And why were these bags hanged on a tree, why did he not just place them on the ground? Have you ever noticed why we never place batteries on the ground? 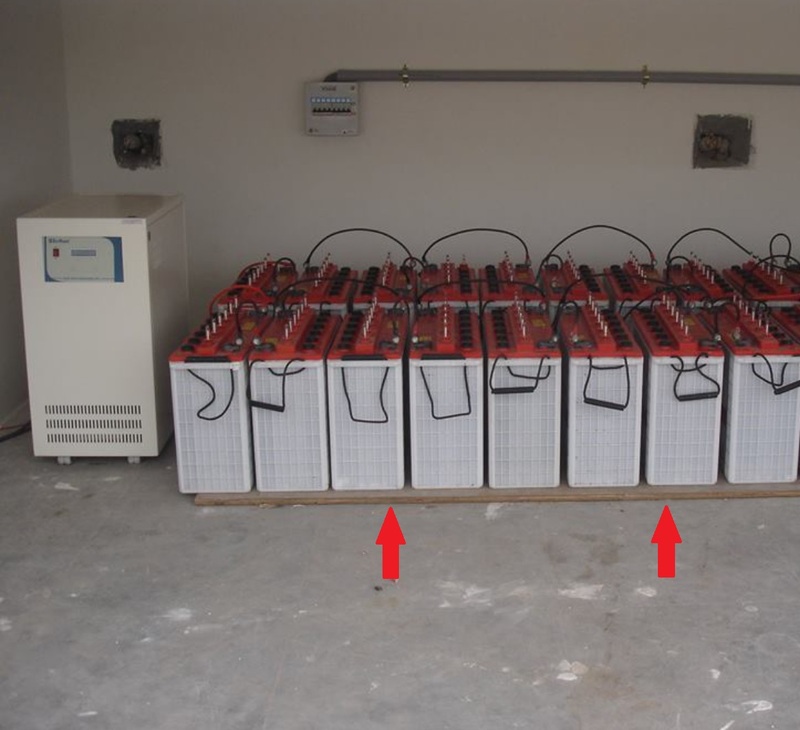 Almost always, we use a non-conductor like wood or plastic before placing batteries on ground. 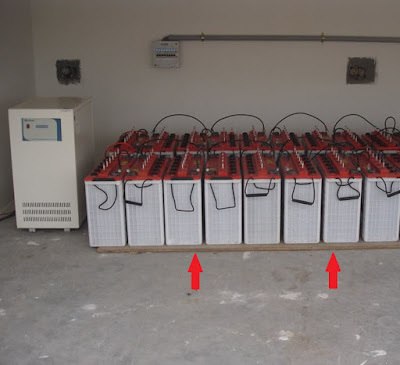 It is common knowledge not to place batteries on ground because it tends to drain rather quickly, and if there is a leak, you will lose all power instantly because of its contact with earth. Did ancient Gods use portable power supplies? Is this handbag, a high powered battery which was used for machining technology and other scientific purposes. Is this why we can see many carvings of gods holding a battery in one hand, and a machining tool in the other? In my videos, I have not only shown you evidence of ancient machining technology but also a 4000 year old battery used in India. 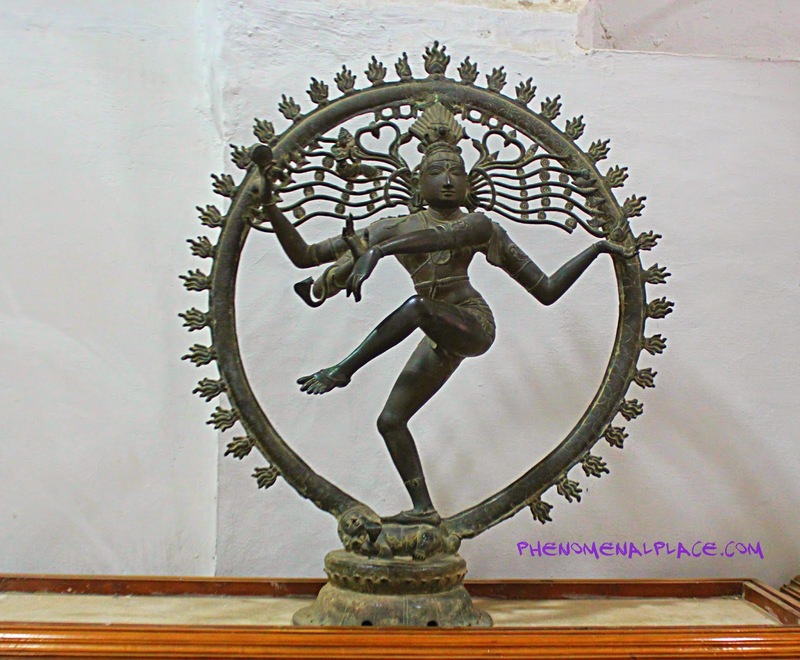 Are all these evidences just coincidences, or is Shiva, the most powerful God, shown here using an actual power source? Please let me know your thoughts in the comments section. 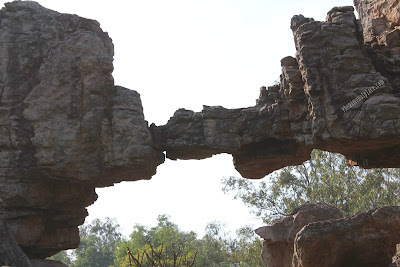 There is a strange stone arch found in the sacred hills of Tirumala. 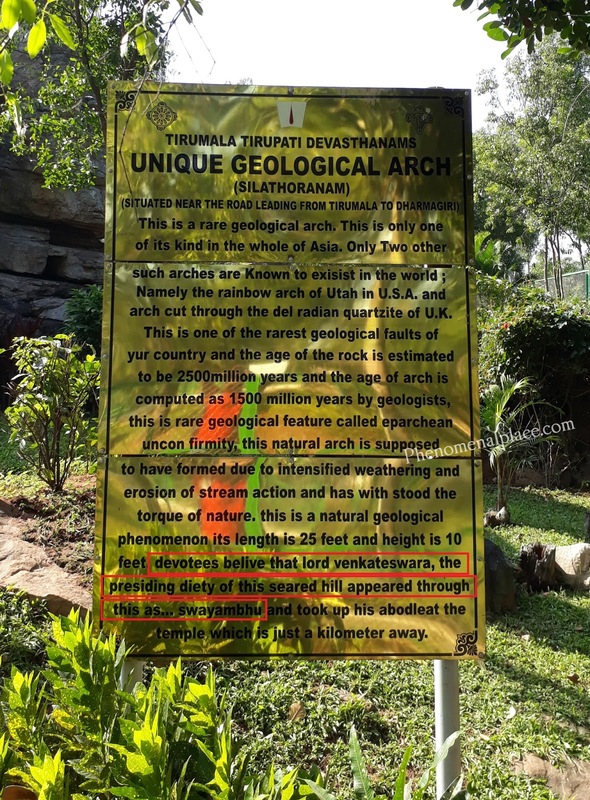 The arch is very big, it is over 26 feet wide and 10 feet in height and geologists confirm that no such formation exists in all of Asia. Scientists insist that this is a natural formation, even though it does not look like a natural structure. If you look at the rocks nearby, they appear to have cut marks at several areas suggesting that it was created with intelligent technology. But there is something much more mysterious about this structure. It emits Electromagnetic radiation at certain times. You may wonder why a so-called natural formation needs an 8 foot tall fence and must be kept locked at all times. I mean, if this is just a natural rock formation, why does it have to be locked? I have tried many times to contact the authorities to open this door so I can examine this closer, but all my requests were denied without any explanation. So I have to show you the footage from the outside, and I could not test the EMF radiation on site with my EMF meter. What could be happening in this area which is so secretive, that it is closed to the public? What could possibly be inside this place, which is just made of rocks? Locals confirm that this structure was open to the public, but something strange started to happen in the last decade when people started using cell phones and cameras. Many people began complaining that their cell phones and cameras died when they got near the arch. One man fainted on site, and doctors examined and found out that his pacemaker had stopped working. People say this is why this place has been fenced off. Is it possible that this structure is emitting some kind of emf radiation that interferes with electronic equipment? The workers who clean this area also told me that they are not allowed to take their cell phones inside. All these evidences indicate that the so-called natural formation emits a strange radiation, which is not understood by human beings. The official plaque on this site says something very intriguing: It reads "Devotees believe that Lord Vishnu, the presiding deity of this sacred hill appeared through this as.. swayambhu" - Swayambu means appearing without the help of any devices or human beings. This means that he appeared through this arch which makes this structure a Stargate. Now, what is a Stargate? Is it a supernatural or fictional device? No, Einstein and Rosen confirmed that there are wormholes, which could transport anyone instantly from one distant planet to the other. The entrance to these wormholes are called stargates. Is it possible that Lord Vishnu came from another planet to earth through this stargate? Locals and religious experts say that this a fact, which is why this structure is called Silathoranam. Silathoranam means a decorated rock gateway. A gateway to what? Have you ever wondered why Indian gods are always depicted inside an arch? These arches are also called Silathoranam and they are almost always adorned with fire.If you ask historians and archeologists why these Gods were always carved within these fiery arches, they don't have any answers. Are these just meaningless arches or did ancient human beings witness extraterrestrial Gods from other planets appearing through Stargates? Locals not only say this is where Lord Vishnu first set foot on earth, but have also carved his feet using a strange stone to remember this event. This carving is estimated to be many thousand years old. Again, we can see that this stone is also locked using a thick plastic box. This stone, just like the Stargate, also emits some strange energy which continuously creates water vapor. You can see that the box is always foggy. What kind of natural stone is capable of creating water vapor? Why are we not allowed to touch or examine these strange artifacts? This artifact and the stargate are just a few of the mysterious structures in this mountain range.. The entire mountain range is considered sacred by Hindus. Half a mile away, sits one of the richest temples in the world. This is where Lord Vishnu lived on earth. It is visited by 60,000 pilgrims every day and receives 100 Million dollars in donation every year. Again, no cell phones or electronic gadgets are allowed anywhere inside this temple. Why are we not allowed to use electronic devices in all these areas? Are locals and religious people talking about fictional stories or advanced scientific phenomena that happened once upon a time? How else do we explain this rock arch that emits EMF radiation at certain times? Is this a stargate that can be activated with sophisticated technology? Why is it locked? And what is the need for locking a stone carving? Why does it automatically create water vapor? Please let me know your thoughts in the comments section. This is an ancient temple at Lepakshi and here we can see this strange carving that shows a very unique deity. You can see that it has a reptilian face, looking like a lizard and the hand gesture shows a blessing posture. Watch the video below or read on. When I asked the locals, who this God is, they told me it is called AnuNaga. 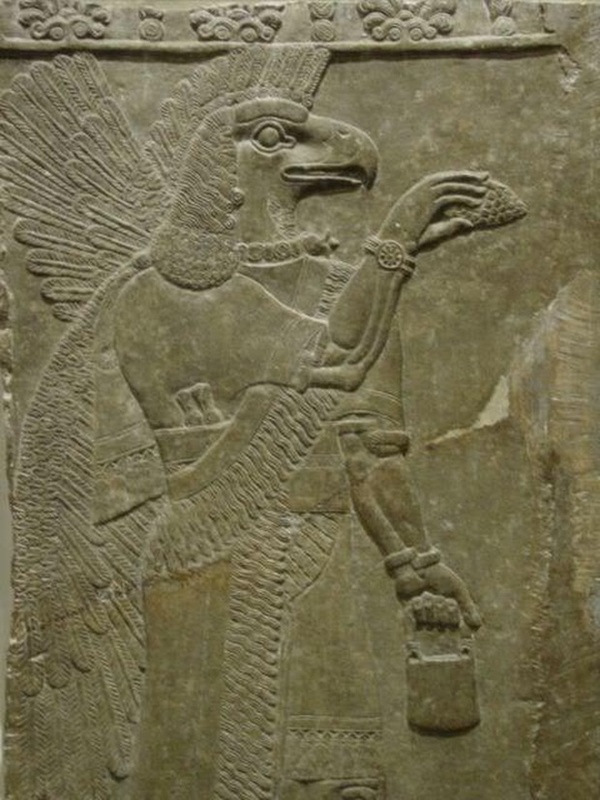 It sounds very similar to Anunnaki, the Gods well known around the Mesopotamian region, which is in modern day Iraq. 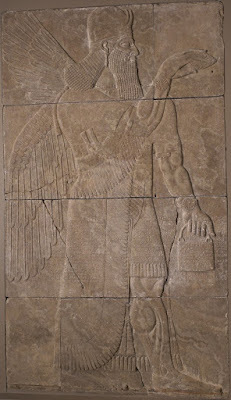 Anunnaki was worshiped by ancient cultures like Sumerians, Akkadians, Assyrians, and Babylonians. Now, is it just a coincidence that these names sound similar, or is Anunnaki being worshiped in this temple as AnuNaga? You can see that the carving is covered with saffron powder, which is considered sacred in Hinduism. This is because, a group of locals, still worship this deity and perform monthly rituals on it. I contacted them and they explained to me that AnuNaga means "those who look like snakes" - the name describing its reptilian features. The prefix Anu means "similar to" and Naga means Serpent in ancient Indian language. 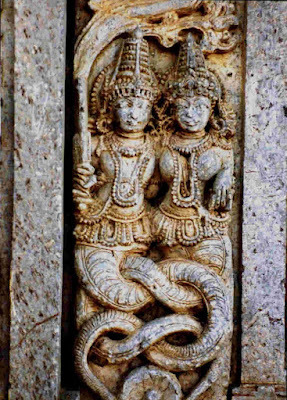 These people claim that this is the original form of Naga, the popular snake gods of India, who were later depicted with hooded snake heads. 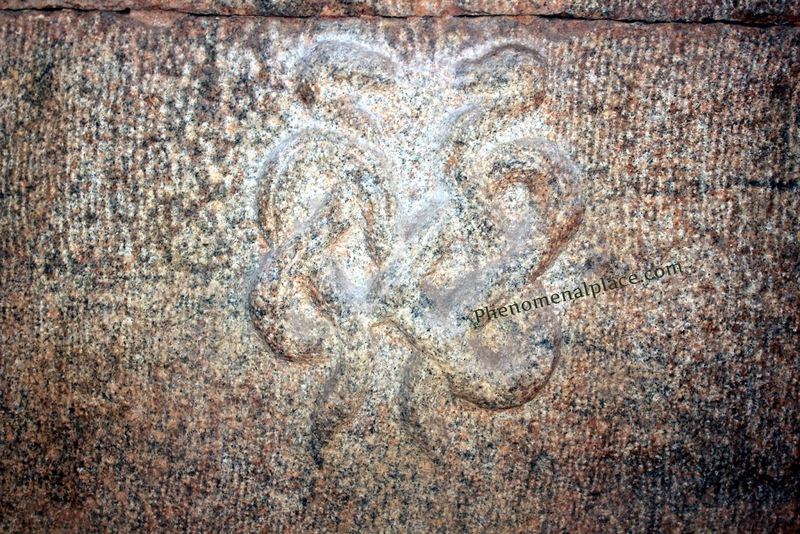 The carving shows legs which are not sturdy, but seem boneless and curved, which were later exaggerated as snake bodies. 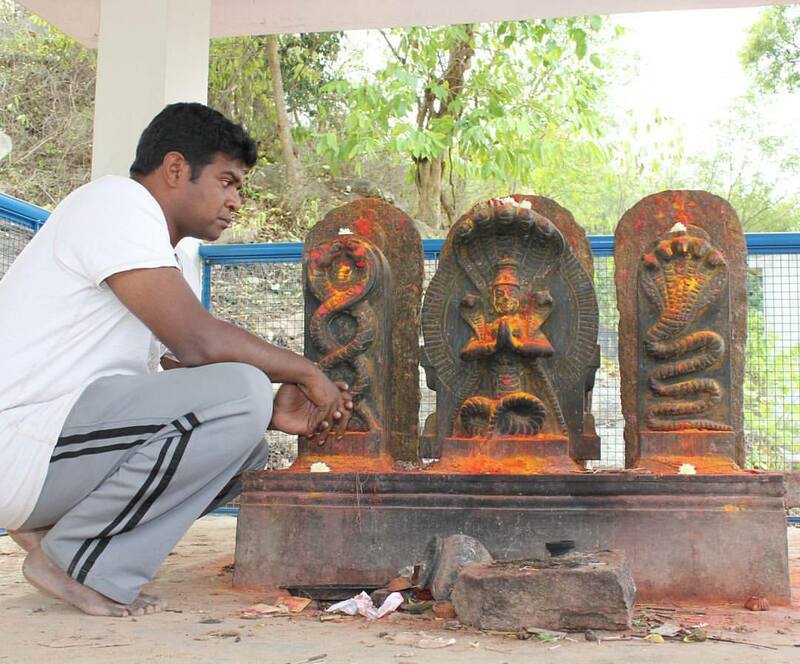 They also insist that all Naga deities must be referred to as Anunaga. 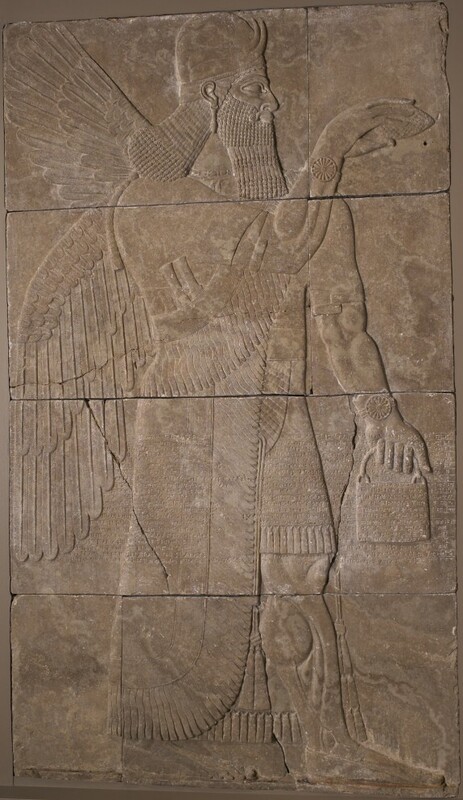 The Sumerian term Anunnaki means "Those who from heaven came down to earth" clearly describing their extraterrestrial origin. Nagas in Indian mythology also come from a different planet, and they prefer to live underground, building vast cities underneath the earth. 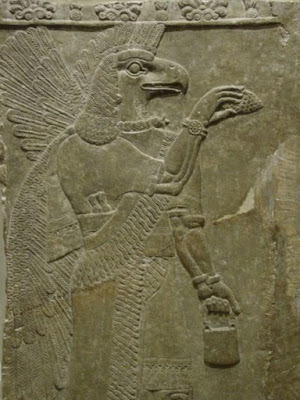 This is identical to the portrayal of Anunnaki, who are the Gods of the Underworld. In ancient Mesopotamian texts, like the Epic of Gilgamesh, there are only seven Anunnaki, ruling the Underworld. 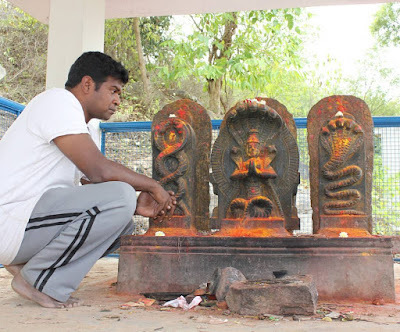 What's really fascinating is that, in the same temple we have the world's largest Nagas carved out of a single rock, and it also shows a total of seven anuNagas or snakes. Are these similarities just coincidences? 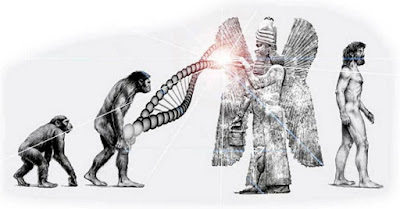 Is it possible that Anunaga and Anunnaki, are really the same Gods? 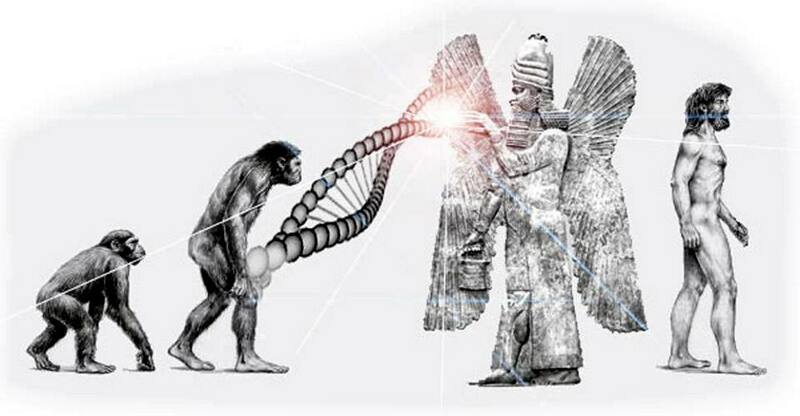 According to Sumerian texts, the Anunnaki was able to genetically modify the human race, which is possible only by altering our DNA. 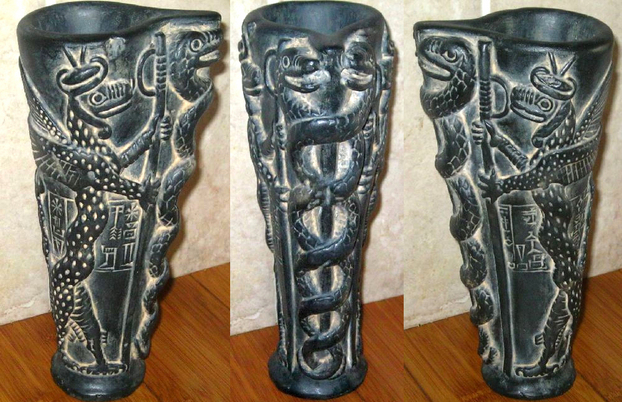 This genetic manipulation is depicted in ancient civilizations by intertwined serpents, which represent the DNA strands. 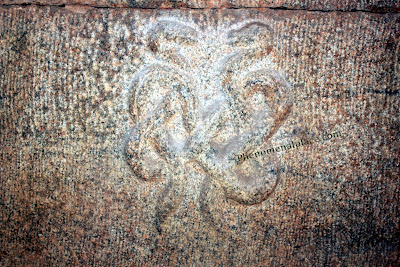 The pillars of Lepakshi temple show a variety of these intertwined snakes, and each carving is different from the other. Is it possible that these pillars show the same genetic experiments done by AnuNaki, which resulted in the creation of mankind. All ancient Naga temples also show these DNA patterns and some even show the emergence of human beings from these DNA strands. Are these mere coincidences or are we looking at remnants of a distant past when Anunnaki or Anunaga landed on earth, and created these ancient civilizations? Now, If the Anunnaki really came from a different planet, what kind of spacecraft did they use? In the same temple, we can see these massive carvings of circular spacecraft, which have baffled archeologists. You can see large circles, which have smaller circles around the circumference. What's really fascinating is that we can see the exact same figures as cave paintings, about 200 miles away. Considered the oldest cave paintings in India, these not only show the spacecraft, but also show extraterrestrials sitting inside the craft. Click here to see the UFO cave paintings. Were these extraterrestrials, Anunnakis who came in flying saucers? More importantly, are Anunnakis and Anunagas one and the same Gods? Please let me know your thoughts in the comments section.